Around 1406 B.C. God brought His people to the edge of the land He had promised to their ancestors, and Moses handed leadership of the nation over to Joshua. After 40 years of wandering in the wilderness, finally the people of God were ready to realize the promise of living in the land of Canaan. All they needed to do is to obey and trust Him in order to take possession of the land. In other words, trust Daddy and do what He says. What is your edge? God spoke something to you a while ago. For some, a long while ago. Is It to begin teaching a Sunday School class? A small group? Or maybe it’s a big step in changing a lot of things in your life. Maybe it’s a little step. Maybe it’s to finally begin leading your family in the Way they should go. Is it to say yes to that mission trip? What promise is God calling you to realize in your life? Some of you are right there on the edge. It’s time. You can see it. You can feel it. The only thing standing in the way is you putting your trust in Daddy God and obeying what He tells you to do. It’s time for you to take that step. Take possession of that promise. 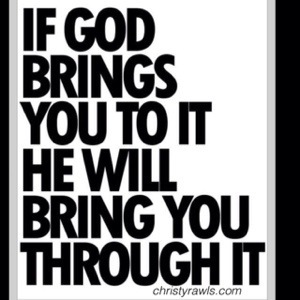 Don’t worry, if God brings you to it, He WILL bring you through it.